Get To Save Up to Ksh 500 and Save a Life On Every Ticket Purchased With Modern Coast Express Ltd. Every Return Ticket Purchased Gives A Donation Of Ksh 100 To Kenya Road Cross Fund For Drought Relief. Offer of Ksh 500 Is Only Offered On a Return Ticket Purchase. One Way Ticket Offer a Ksh 150 Savings and a Donation To The Red Cross For Ksh 50. This Offer Cannot Be Combined With Any Modern Coast Offers Or Specials. Offer Is Applicable On All Routes Except On The Modern Executive Buses (Luxury), V.I.P and First Class Seats. To Redeem Offer, Travelers Require a Modern Travel Card On Which Above Applied Discounts Do Not Earn Travel Points and Only One Ticket Opening Is Allowed i.e Change Of Travel Details e.g Date and Time. 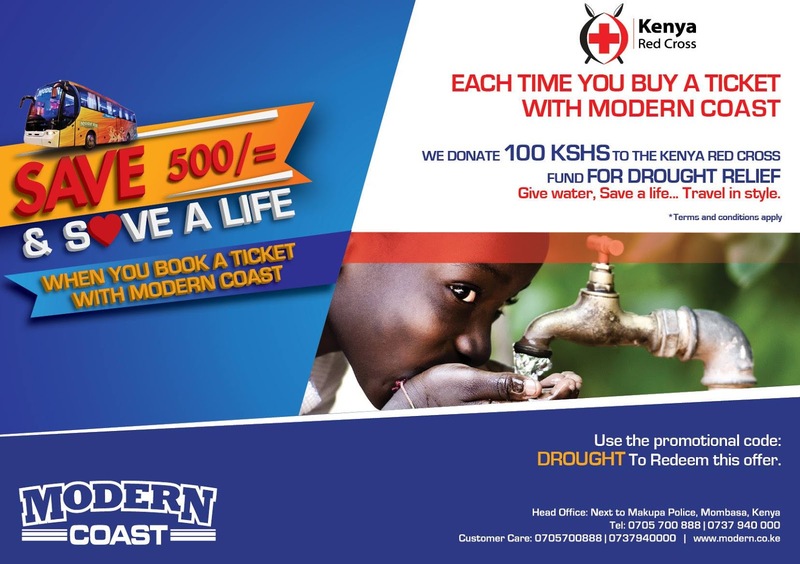 Book With Modern Coast Now and Help Eradicate Hunger and Starvation In The Face Of Kenya.